Real/Time Interventions is the creative partnership of playwright/ experience designer Molly Rice and director/ producer Rusty Thelin. Real/Time Interventions creates theatrical events and public experiences that depend upon the immediate nature of live and real-time art, especially events that come to life when people come together. We seek to generate connection, curiosity and wonder with our work, and to help audiences re-see their surroundings in new and unexpected ways. 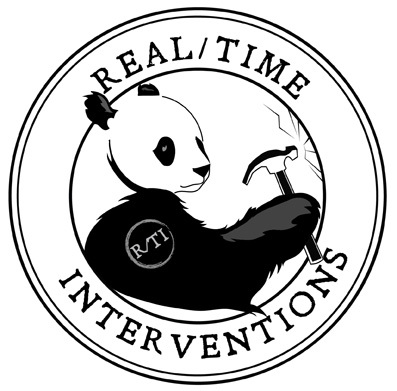 R/TI creates narrative art in rich conversation with a broad range of collaborators, from theater artists to scientists to rock bands to social workers to our neighbors down the street. We seek to create small, vibrant "companies" with every new project, peopled by individuals from diverse walks of life and realms of experience who are bound by the creative impulse driving each piece, or their stake in the story we're telling together. There is no other company in Pittsburgh who provides the wildly diverse offerings of brand-new live art and theatrical events that Real/Time Interventions offers. From community workshops in which we are inventing a brand-new sport with Pittsburghers to a theatrical bus tour around the entire town of Braddock to a new cabaret musical about female serial killers, Real/Time plunges into new territory with both childlike abandon and 40 years of collective theatermaking experience. Artists' work and time costs money. So does the production of high-quality live events (space, lighting, construction of sets and costumes, etc). For nonprofits, ticket sales cover only part of the costs of making this magic. We rely on donations from individuals like you, who recognize the value in the live experiences we provide.